Sometimes it's just simple things that make sense, like the Innovelis BudFits -- over-the-ear adapters for Apple iPod and iPhone earbuds, available in several colors for around $9. Yes, the Apple earbuds work fine for casual listening. But, like other in-ear earphones, you need to insert them firmly into the ear so they stay seated, especially when you're moving around. But that pressure and friction in your ear can be wearing after a while, . And, even with a tight fit, in-ear earbuds can slip out when you are doing physical activities like running or cycling. The BudFits stop the ear wedgies for iPod earbuds. They are made from soft, flexible plastic -- just snap them onto the iPod earbuds, and slip the earpiece over the ear -- the earbud then can be nestled gently in the outer ear, instead of being inserted deeper into the ear canal. As a bonus, the cord wraps in a channel up and around the back of the ear, so it's more out of the way. The result is a comfortable fit that still works when you're on the go. Easy! The BudFits are designed specifically to fit Apple iPod (or iPhone) earbuds. The base is sized to snap around the post at the base of the Apple design (with the light gray band). They could therefore work with other earphones with a similarly sized design. Happy New Year! To celebrate, here are some non-tech origami paper flowers to brighten the winter and anticipate spring events and weddings. These are created by Karin Hope Dixon, an artist and graphic designer that I happen to know well ... The different designs are described at her Everlasting Blossoms site, and around 100 individual bouquets and flowers are available from her store on Etsy. 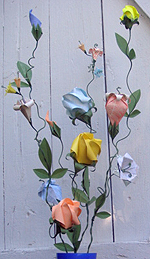 - Bouquets and bunches of classic origami, specialty, and rose designs and accents, including nested designs, blossoming and buds, and baby blossoms. 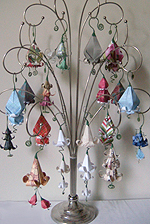 - Earrings and hanging ornaments, with hook or hoop earrings. Simple and elegant to fun and fanciful. 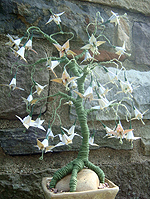 - Blossom Bonsai tree, formed of cloth-covered floral wire, wrapped to form a trunk, rooted on stone, and tipped with blossoms. I'm a big believer in preventive maintenance for PCs. Windows systems just accumulate cruft over time, as the disk fills up with junk files, disk access slows down with files broken into multiple fragments, and more and more applications want to be part of the start-up process to run background tasks. And even when you try to be good and uninstall old applications, they still leave remnants of orphaned files, broken shortcuts, and unneeded entries in the Windows Registry file. And that's when things are going good ... Crashes and bugs can cause corrupted files, and malicious attackers can do even more damage. Since I don't want to wipe my disks and reinstall Windows every year or so, I run variety of tools like Symantec / Norton WinDoctor and CCleaner (freeware) to try to keep the mess to a minimum. Recently, I've been trying out iolo technologies System Mechanic as a all-in-one approach to keep my systems under control, with PC system and security analysis, optimization, and repair. System Mechanic has been developed for 10 years and through eight major versions; iolo reports that it is the the #1 best selling PC tune-up product according to NPD Reports. System Mechanic has some 40 tools to fix, speed-up, and maintain PCs. But it organizes these in an integrated console, so you can just run them all automatically to fix problems, or drill down to individual tools to examine problems and customize the repairs. And System Mechanic features ActiveCare technology to run in the background to monitor your system status and optionally fix problems. System Mechanic 8.5, released in December, has improved ActiveCare options to stay out of your way when you are working, so it only runs when the system is idle. I have it set to only collect status, which it insists on doing at least once a day. Version 8.5 also adds a Defragment and Compact Registry tool to clean out bloat, a new DriveSense tool that provides real–time data about the status of hard drives (requires internal SMART drives), and tools to find unnecessarily startup programs and to detect potentially dangerous software. The System Mechanic interface is a bit confusing in its desire to serve all types of users -- novice, intermediary, and more advanced. The main Dashboard provides one-click display and repair of problems. The ActiveCare tab shows options for automatic fix-up in the background. Then the Power Tools tab offers one-click PC Total Care to run all the tools, or four wizards to run collections of tools: Accelerator, Repair, Cleanup, and Security. Finally, the Individual Tools tab then reveals all the 40-some tools, but organized slightly differently into seven categories. Plus, there's a Reports tab for IntellStatus information on system resources, and the History of recent changes, including the SafetyNet option to undo changes. Some of the more interesting tools are Optimize Startup, to suggest removing unnecessary startup programs; and Fix Security Vulnerabilities, including Widows services, network settings, and exploitable file type associations. Most tests provide options to run quick or complete automatic test and repair, or customize the process by generating a report and then manually choosing items to repair. System Mechanic also provides nice visual status reports on system usage and performance, and clean listings of system elements such as startup programs. iolo is currently running deals on its website: System Mechanic 8 is $49.95 list, $34.97 on the website, with annual renewals for $29.95, or $14.95 for a limited time. You don't need multiple copies: one license can be installed on up to three machines. And iolo provides free, unlimited technical support and customer service. 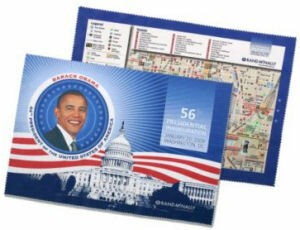 There's also a System Mechanic Professional bundle for $69.95 list, $48.97 on the website, with $39.95 annual renewal. It includes other iolo tools: iolo AntiVirus, iolo Personal Firewall, DriveScrubber to securely erase data, and Search and Recover to rescue deleted files from hard drives, CD/DVDs, portable devices, and memory cards. You can download a trial version to check it out. The new SanDisk slotMusic card format delivers music "albums" on microSD cards, ready to play on billions of mobile phones with microSD slots, and also free of copy protection so they can be transferred to PCs and other devices (see previous posts). The slotMusic format is a nice way of delivering no-fuss digital music, but putting only one album with 10 or so songs on a microSD card is a huge waste of space in an era of multi-gigabyte cards. And carrying around music on the tiny cards and swapping them on the go could be something of a pain. Instead, the SanDisk slotRadio card format, announced at CES in January 2009, fills a card with a thousand songs, professionally selected and pre-organized into genres and themes. The idea is to present a lean-back "radio-like" experience -- you just select the type of music that you're interested in hearing, and the playlist is ready to go. SanDisk is releasing the SanDisk Sansa slotRadio Player in early 2009 to play this new format for $99.99, including a 1,000-song card. The slotRadio mix card will have around 10 genres (rock, contemporary, country), so you can choose the style of music to fit your mood and then just enjoy. Additional cards will be available for $39.99, with all 1,000 songs selected for a specific genre or theme. Unfortunately, unlike the slotMusic format, the slotRadio cards will be copy protected (with SanDisk TrustedFlash). The format initially will only be playable in the Sansa slotRadio Player and the Sansa Fuse player, and not on the the older View and Clip models. SanDisk also is working with mobile phone vendors to support the slotRadio format in new models -- both the DRM and the slotRadio interface to access the music. How comfortable are your earphones? The Apple iPod (and iPhone) earbuds are designed to hook just inside the ear. Other earphones use a design with a soft earpiece that fits into the ear canal. Or you can use AcoustiBuds to convert iPod (and similar) earbuds to an in-ear design. These earbud adapters slip over your existing earphones, and have rows of soft fins to hold securely in your ears. Install them by folding back the elastic end and then rolling them over the earbuds. The AcoustiBuds are soft and flexible, and angled down for a comfortable (and secure) fit. They seat snugly in the ear, and provide better sound by enhancing your music and isolating it from outside sounds. 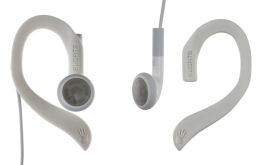 The AcoustiBuds are available in white or black for $19.99 ($12.99 street), and come with two sizes, with 5 or 6 fins. Besides iPods and iPhones, they also fit a variety of music players and earphones including Microsoft Zune, SanDisk Sansa, Samsung, and Creative. They also received a CES '09 Innovations Award. The Victorinox Swiss Army Knife people have had a fun time over the past few years extending from their core product of steel multi-tools into, believe or not, the digital world. Of course, carrying your USB drive as part of a pocket knife is not going to be a good idea when you are flying, so the flash drive can swing out and be removed, and the knife can go with your checked luggage. Joby -- the people behind the clever Gorillapod line of flexible tripods (see previous post) have come up with another inventive design. The Joby Zivio Boom Wireless Headset features a telescoping boom that extends the microphone much closer to your mouth. The boom also can be bent to fit better to your face. The result is less background noise, and less need for you to talk loudly to be heard -- plus a visible signal to others that you're talking on the phone. In my testing at CES when walking near traffic along Las Vegas Boulevard, the conversation came through clearly, except when a very loud bus went by, and I was able to talk quietly and privately along the street, in the casinos, and on the exhibit floor. There was some background static audible in quiet environments. 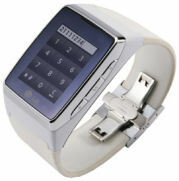 The Zivio also is designed to help you customize the fit. The ear bud pivots on a ball-and-socket joint so it can nestle at a better angle into your ear, and you can choose between multiple sizes of both mushroom earpieces (to fit snug in your ear canal), or scoop gels (that hook into the ear). The Zivo is light enough to stay in your ear with just the earpiece, but the Zivio also includes optional ear loops which attach magnetically to the back of the unit. I found the Zivo worked well with just the mushroom earpieces, although you do need to wedge them in to hold securely, and they can loosen up and need to be adjusted as you move around and sweat. The ear loops may work better and be more comfortable for extended wear. The headset recharges with a standard (micro) USB connector, and is speced to run for 10 hours talk time, and 200 hours on standby. The product ships with a handy dual USB adapter (so you can charge two devices at a time from a wall outlet), and helpfully includes both a short (5 1/2 inch) and longer (5 foot) USB cable. The Zivio Boom is available for $129, in black and now in a light blue. You can battle the elements, and take pictures of them at the same time, with the newly-announced Panasonic LUMIX DMC-TS1 Digital Camera -- a rugged camera that shoots 12.1 megapixel high-res stills and 1280 x 720 high-def video. With an airtight body, rubber padding, and reinforced glass, the LUMIX TS1 is designed to be waterproof to a depth of 10 feet, shockproof from falls up to 5 feet, and dustproof. The TS1 shoots still photos in 4:3, 3:2, and widescreen 16:9 aspect ratio at up to 4000 x 3000 (12 MP) resolution, in JPEG format (optionally with audio clips). And it shoots SD and HD video in 4:3 and 16:9, at up to 1280 x 720, 60P, in AVCHD Lite format at 9 to 17 Mbps quality, plus Motion JPEG. The product includes a (mini) HDMI interface for displaying directly on HD displays. The camera uses a 28mm wide-angle LEICA DC VARIO-ELMAR lens (to 128 mm telephoto in 35mm equivalent), with 4.6X optical zoom. The TS1 also features the Panasonic iA (Intelligent Auto) processing to automatically set up the camera for the current subject and environment, including Face Detection to adjust focus, exposure, and contrast, and Intelligent Scene Selector to switche between Normal, Portrait, Macro, Scenery, Low Light modes. And the camera features also work when shooting video, including Optical Image Stabilization and Optical Zoom. Panasonic LUMIX DMC-TS1 is scheduled to be available in April for $399, in silver, plus surprising shades of green and orange (so you can more easily find the camera after you drop it on the ground or it falls in water). See my Digital Photo Cameras Gallery more on consumer digital cameras. Once of the most visible trends in this season's new camcorders coming out of the CES conference is the rapid adoption of the smarts from digital photo cameras into video camcorders. The new photo cameras try to be more fail-safe than ever (see previous post), with automatic scene selection (Normal, Portrait, Macro, Scenery, Low Light), and not only finding faces in the scene to adjust the exposure, but even looking for smiles on the faces, or recognizing faces that have been identified before. And the video modes in digital cameras are getting better, taking advantage of the photo features and moving to high-def resolution. But video camcorders are moving forward too, with full HD video, longer optical zoom, and also shooting higher-res stills. Another clear trend for camcorders is the success of the flash memory and hard disk drive (HDD) formats, and the demise of the tape (DV) and disc (mini-DVD) formats. Flash camcorders are rugged and can be amazingly small, and hard-drive camcorders can store some 30 to 60 hours of HD video before needing to worry about off-loading your clips. For example, the 2009 line of Panasonic camcorders, most due out in April, includes SD models which use flash storage cards (SD/SDHC), HS hybrid hard disk models plus SD card, and TM models with Twin Memory storage -- built-in memory plus SD card. Panasonic offers two standard-definition models with not 20X, or 50X, but 70X optical zoom -- plus an optical image stabilization system to reduce hand-shake even at these extreme zooms. The SDR-S26 (shown here) is a small flash memory cam (SD card) for $329, in bright colors (another trend). The SDR-H80 and SDR-H90 are HDD models, with 60 and 80 GB, or up to 72 hours of recording (in LP mode), for $449 and $499. For shooting in high-def, Panasonic has three new introductory high-def camcorders with different format combinations, the compact and lightweight HDC-SD20 with SD card for $599, the Twin Memory HDC-TM20 with SD card plus 16 GB built-in memory for $649, and the hybrid HDC-HS20 (shown here) with SD card plus 80 GB HDD for $999. These include a touch-screen display, an intelligent index system that detects scene changes and shooting adjustments to skip rapidly through recorded video, and 5-microphone surround sound audio. Then the more advanced, semi-pro HD camcorders add three full-HD MOS sensors, for over 9 megapixels of resolution. The compact HDC-HS250 and the HDC-HS300 with more manual controls have 120 GB HDD for $999 and $1,399, and the Twin Memory HDC-TM300 (shown here) has 32 GB of built-in memory for $1,299. Yes, you can be shooting HD video for under $600, and full-HD video plus 9 MP stills for under $1000. See my Digital Video Camcorders Gallery more on Panasonic and other digital camcorders. OtterBox Cases for iPod, iPhone, BlackBerry, etc. More and more of our lives have converged into our electronic devices -- MP3 players and smartphones, iPod and iPhone, BlackBerry and Palm. Yet these now-indispensible devices are rather fragile, just glass and plastic that is one drop away from disaster. And even if our gadgets survive the inevitable small accidents, they still will become beat up from the normal wear of daily use. You can protect your devices with a layer of protective plastic (see previous post on the ZAGG invisibleSHIELD Protective Film), or try any number of different and fancy case designs. Or you can defend them from bumps, shock, and drops with protective cases from OtterBox, makers of the OtterBox 1000 and 2000 crushproof and waterproof drybox cases for storing cellphones and other small valuables (around $11 to $17). 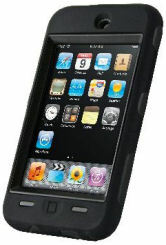 The OtterBox Defender series includes cases for different models of the iPod, iPhone, Blackberry, Palm, and other smartphone devices. These include clear polycarbonate screens over the display and camera (and ambient light sensor), a high-impact polycarbonate shell, and a silicone skin to absorb bumps and shocks. You still can access the controls through the case, while acoustic vents protect the mic and speaker. 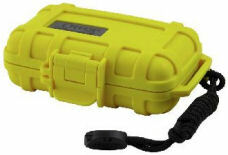 These OtterBox cases range from around $12.95 for the iPod nano to $49.95 for the iPod touch. 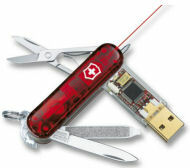 See my Portable Peripherals and Accessories Gallery for more on protecting your devices. Consumer video has gone YouTube. -- It's so easy and fun to shoot a short little clip on your camera phone, grabbing a brief slice of life (cool -- the cat in the toilet! ), and then upload it to enjoy and share with the world. However, that's not terribly creative, compared to the kinds of productions we see on TV and at the movies. But the step up to doing video editing is so daunting -- getting your video into a computer, learning editing software, figuring how to get it back out again -- as well as putting yourself in a position to having your amateur production skills compared to broadcast series and Hollywood movies. 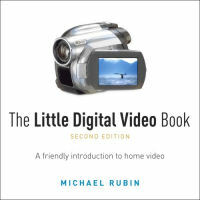 But if you are interested in creating your own videos, then Michael Rubin's The Little Digital Video Book is a great way to get started. Rubin lays out the basics of shooting and editing video, along with good advice about how to keep the process enjoyable. One of Rubin's key points is to not overreach -- not to try to make "movies," but instead create what he calls "video sketches," shorter pieces that start with around 20 minutes of raw video and can be edited down to around a 4 minute enjoyable sketch. This is a much more reasonable target -- you can shoot for a while at an event to try to capture a sense of it, and then spend a couple hours editing it. You're then not feeling the pressure to shoot an entire event, and you don't have a big production with days of work hanging over you. Instead, you can tweak it for a couple evenings, and then declare it done. For the same reason, Rubin recommends not loading yourself down with extra equipment while you are shooting -- tripods, lights, special filters -- but instead provides extensive descriptions of how to get a good selection of shots that you can later edit into a clean production (close-up, medium, wide, establishing, cutaway). After you're done shooting, Rubin has an extensive discussion of organizing and logging your tapes and then getting the clips captured and organized on your computer so that you're ready to edit. 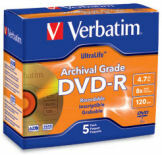 It's easy to take shortcuts at this point, but you'll regret it later, when you can't find a certain clip that you remember in a pile of unmarked tapes, and as your computer fills up with large unidentified video files scattered around the disk drive. Rubin finishes with advice on the process and art of editing, with a series of "assignments" to lead you though shooting different types of videos (interview, music video, slice of life). 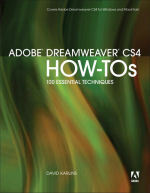 In some ways this is an old-fashioned book, focused on the art and process of editing instead of instant-gratification uploading, using tape-based (DV) camcorders (which are disappearing in favor of memory card and hard disk drive formats), and ignoring the exotic new high-definition formats. Instead, Rubin is interested in making video editing fun and enjoyable, so you can be creative in shooting interesting material and then editing it into enjoyable vignettes. The book is indeed little, and approachable for beginners, at 7 x 7 inches and 240 pages. And it's particularly well illustrated with shots of the different components and controls of a camera, visuals explaining different shooting styles and types of shots, and screen shots illustrating the basics of editing. Plus there's plenty of good advice here even if you already have a camera and some editing experience. Entries posted to Manifest Tech Blog in January 2009, listed from oldest to newest.